Pickings are mighty slim in the garden right now, but I do have mache. This freely self-sowing (not to say weedy) tender salad green is the most green thing I’ve picked in months. While I was looking the other way, it’s filled an entire bed with these little, nutty rosettes. I like mache, I really do, but only at the right time of year. In warm weather it becomes unpleasantly minerally and almost soapy. 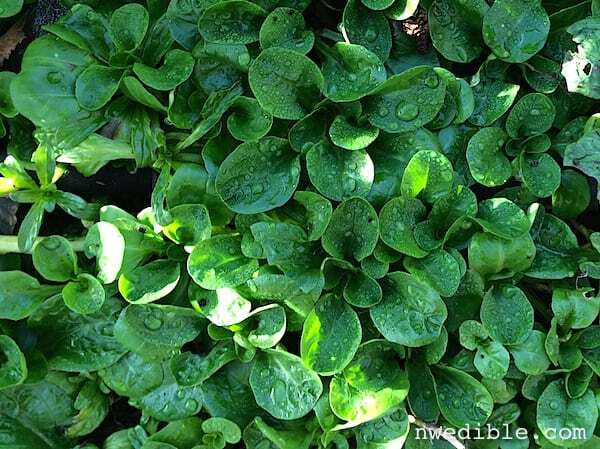 But at these low temperatures where nothing else is actively growing, it’s a delightfully charming lettuce alternative. Growing mache doesn’t require much. Scatter seeds on the ground in mid-fall and let them overwinter. Cold doesn’t faze mache. They will germinate and start growing when they are ready and then, one day, you’ll have a mid-winter salad when you thought there was nothing to harvest! Alternatively, if you can’t find your small harvesting snips and you’re wearing overthick winter gardening gloves, you can do what I did and pull entire small plants, root and all. You’ll be in for a slightly more involved cleaning process, though. Growing so low to the ground, mache tends to get dirty. My “yank it up” approach doesn’t help. Really, don’t be like me – take the time to go find your gardening scissors. To clean my dirty mache, I just put on a podcast and worked through my harvesting bowl, pinching out the root of each cluster and trimming off any yellow leaves, then tossed the mache into a big bowl of water. The soak-and-swish method works well for cleaning mache. Let everything settle, and the dirt will fall to the bottom of the bowl. Rinse twice if needed, then spin dry. Now turn it into a salad. 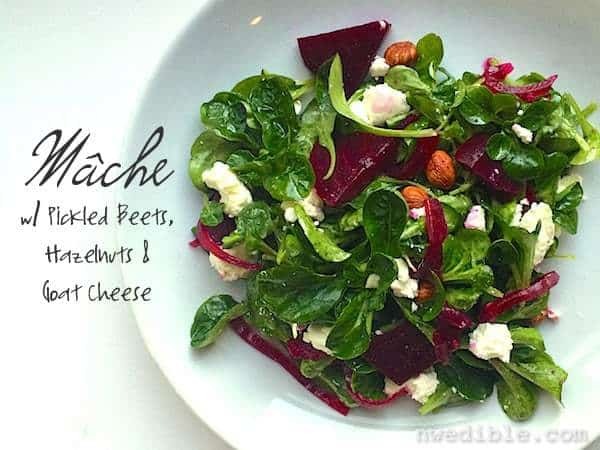 Flavors that play well with mache include nutty things like walnuts, hazelnuts, nut oils or browned butter, creamy cheeses like goat cheese or blue cheese, and pungent flavors like anchovies or bacon. I had pickled beets, hazelnuts and goat cheese on hand so that’s what I used. This isn’t a proper recipe. You don’t need one. Just lightly toss the dry mache with some good olive oil or nut oil, like hazelnut or walnut oil. Just a drizzle, then turn the mache over in your fingertips patiently, like you are brushing the tangles out of a young child’s hair. When the mache is protected by the oil and glistens, add a nice pinch of salt and a few grinds of pepper. Skip the vinegar – the pickled beets will add enough acid. If you aren’t using them, a few drops of sherry or good red wine vinegar is all you really need. Again, turn the mache over a few times to distribute the seasoning. Scatter whatever you like overtop. I tossed a handful of hazelnuts in there (didn’t even chops or toast them – oh well) then crumbled a big hunk of goat cheese and drained off a pint of pickled beets and onions and added them to the party. The result? Well, my ten year old asked for seconds but by that point, it was all gone. I’m calling that a win. 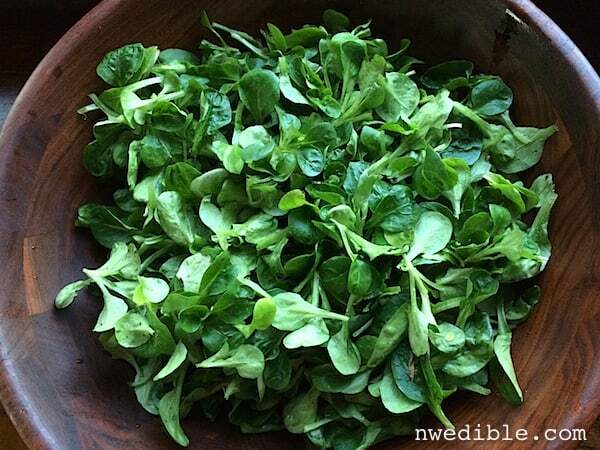 What are your favorite vegetables for deep winter salads? Erica – Thank you for including the gorgeous photos of all that lovely mache … it gives me hope that, following the sub-sub-zero temperatures that we are enduring here in Toronto, the world will turn green again in spring! And I’m definitely keeping this salad in mind – anything that has a 10-year-old asking for seconds is obviously a winner. Thanks for pointing that out Mary! I’ll change it now. Oh that is beautiful! Sounds like a salad green that is right up my alley to grow, too. Mache is taking over my garden and I have beets. 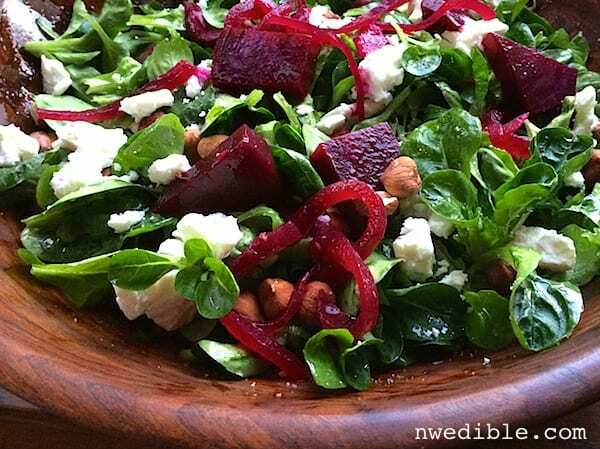 Assuming roasted beets will work instead of the pickled ones, I’m going to give this salad a try – your pictures looks fabulous. 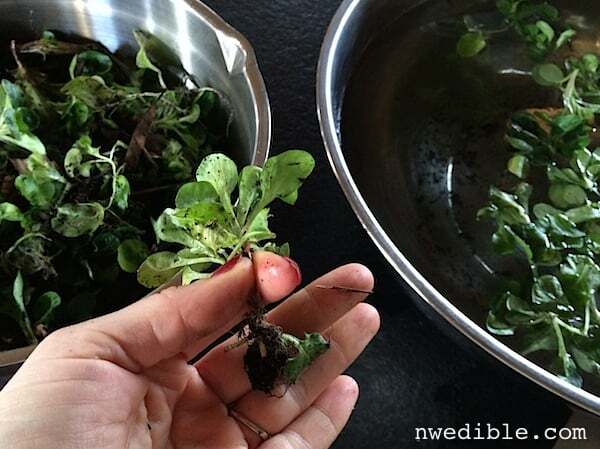 Have you tried growing wintercress? It competes well with the mache and has a completely different flavour – albeit rather strong, but my family likes it. We also have a self seeding bed of mache. I do love how it just appears when you don’t have much else. It does like to spread out, though. I’ve been thinking about planting mache–thanks for the harvesting warning. My favorite winter salad has been lacinato kale rubbed with olive oil and salt, with lemon zest and a little lemon juice and parmesan. But I think I’ll copy your salad, using up my arugula.